I’ll be teaching the Monomoy Cowl in my Introduction to Stranded Color Work Class at Bo Peep in Ligonier on February 21st at 10 am. Stranded Color Work looks so difficult and complex, but once you learn a few simple tips and tricks you will be playing with color and yarn in a whole new way. In this class you will learn a Provisional Cast On, knitting while holding the yarn in each hand, weaving in the carried yarn, yarn dominance, how to tension your yarn for even stitches, speed swatching and blocking. There will also be a discussion of various color work techniques. 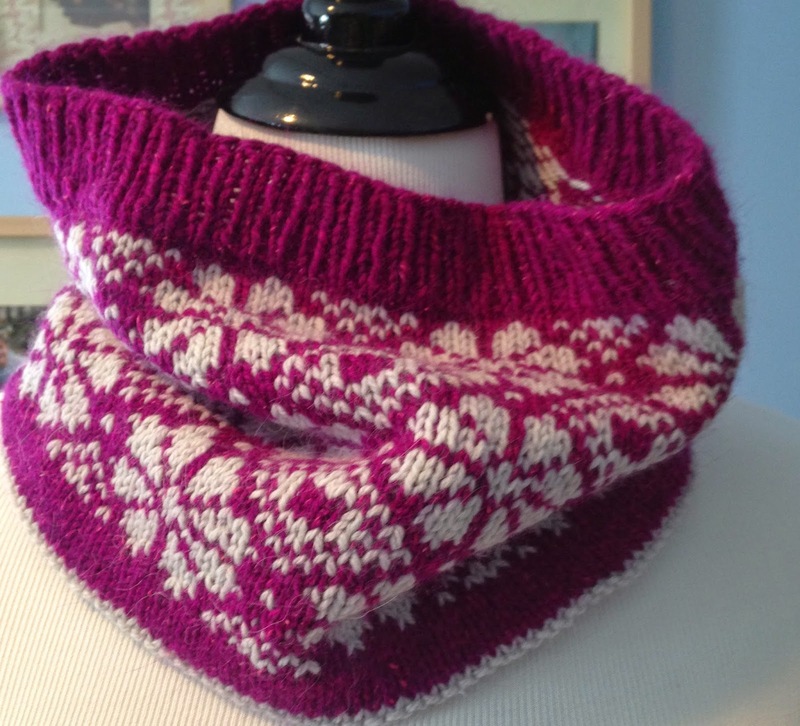 Once you have mastered the techniques in this cowl you can move on to more difficult color work projects, perhaps even a sweater!!! Experience Needed: Comfortable with knitting and purling, casting on, binding off, able to crochet a chain. Some experience knitting in the round helpful but not necessary. Yarn: 1 Skein each of two contrasting colors of Kenzie; 50% New Zealand Merino, 25% nylon, 10% angora, 10% Alpaca, 5% Silk Noils, 150 yds per 50g skein. Colors used 1015 and 1010 (Or any worsted weight yarn) A smooth waste yarn, cotton preferably, in worsted weight, about 48”. Crochet Hook: Size G or as large as Size J. Call Bo Peep at 724.238.4040 to sign up.